The roof is the most critical parts of your home because it protects you and your family from elements and animals. Eventually as the house ages, so does the roof. Whether the roof is affected by the weather or common aging symptoms, the decision to repair or replace the roof is up to you. A few factors to consider is if the damage is minor or significant, the cost, and your homes’ appearance. Most times people don’t think about their roof until something goes wrong. The sooner you quickly fix the problem, the easier it will be to control the situation. If you’re not familiar with common roofing problems, read on to find out how to identify them and what to do to fix it. One day you’re sitting in the living room, look up at the ceiling, and notice a water stain. One common roofing problem is a leaky roof. 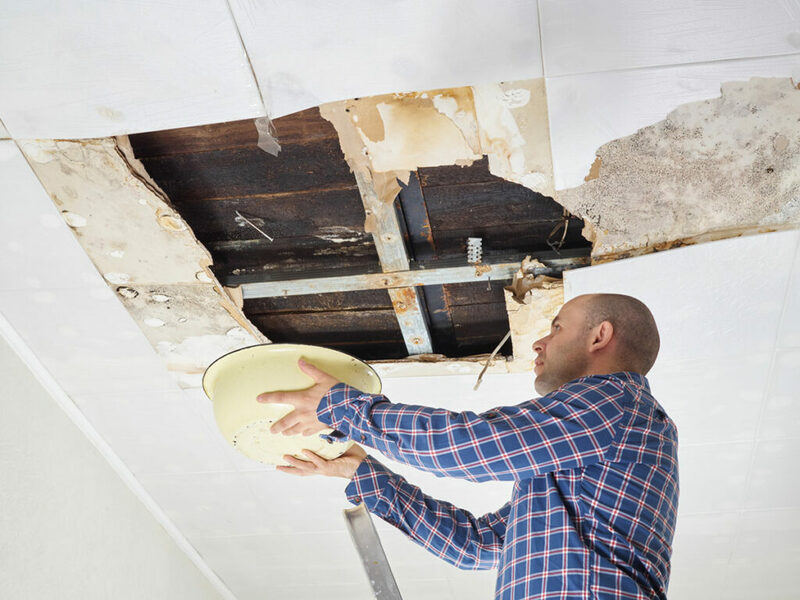 Water damage not only affects the roof but the entire home. When you see water stains, you must act quickly. Prolonging the situation will result in the leaky roof issue spreading to other areas of the roof. The more extensive the repair, the more money you will spend. An early sign of a leaky roof is a bucking or missing shingle. Contact a professional to investigate the source of the leak and fix it. Another reason why your roof is leaking is because of a faulty roof flashing. What is roof flashing? It is a weatherproof barrier between the different joints of the roof. Over time it can warp and become damaged. The height and pitch will determine if you should patch it up by buying the materials from your local hardware store; otherwise, call a roofing professional to fix the roof flashing. A regular roofing inspection can identify flashing problems before it becomes a problem. Moss may seem like harmless plants that grow on trees and end up on your roof, but moss buildup can also damage your roof. If you live in a moist and cool environment, you may have noticed an overgrowth of moss on your roof. How does moss damage your roof? Moss increases how much water your roof can hold and shorten the lifespan of your shingles. As you’re planning to get rid of moss, please don’t consider getting your roof pressure washed— it will cause further roof damage. Instead, visit your hardware store and buy a roof cleaning solution that will get rid of moss and keep your shingles intact. If moss is a consistent issue, find the source of it. If there’s a large tree looming over your roof, remove it. Water stains on the ceiling or improper home ventilation are causes for concern, and the first place you should look is your roof. Common roofing problems include leaking roof, roof flashing, and moss on the roof. Whenever you’re having a hard time spotting the source of your roofing problem, call a professional to assist you.